We’ve all had our hearts broken. But each of us has dealt with it in our own way. Edward Leedskalnin coped by creating a castle made of coral. When I first moved back to Miami a year ago, one of my goals was to rediscover my hometown. While going through a Florida guidebook, I came upon the story of Ed and the incredible structures he built and I was immediately intrigued. And I felt so bad for him!! You see, Ed got dumped by his fiancée Agnes a day before they were supposed to get married. And he never quite got over it. Originally from Latvia, he eventually settled in South Florida due to his tuberculosis and the better weather conditions. This table looks a lot like Florida! From 1923 to 1951, he worked on the many sculptures and the surrounding walls of Coral Castle, all a testimony to his undying love for Agnes. The craziest part about the whole thing, is that no one knows how he did it. Ed was just over 5 feet tall and weighed 100 pounds. Some of the carvings weighed tons! Plus, he only worked at night so no one ever saw him. This was at a time when there was no large machinery and all he used were hand tools. So how did he do it? When asked, all Ed would say was that he understood the laws of weight and leverage and that he knew the secrets of the pyramids. The original gate is no longer in use. It ways 9-tons but could easily swing by just the push of a hand. Walking around the grounds, it really was remarkable to think that someone made all those sculptures by hand. And many of them were love or marriage themed, which made me wonder how Ed was feeling or what he was thinking as he carved them. So what do you think of Ed and Miami’s own mini version of the Taj Majal? Fascinating. It looks like an ancient monument too. I’m sure it will gain in fame! Hi Fiona! Yeah, it looks pretty cool! I attended college in Florida and often made the 6-hour drive down to Homestead. 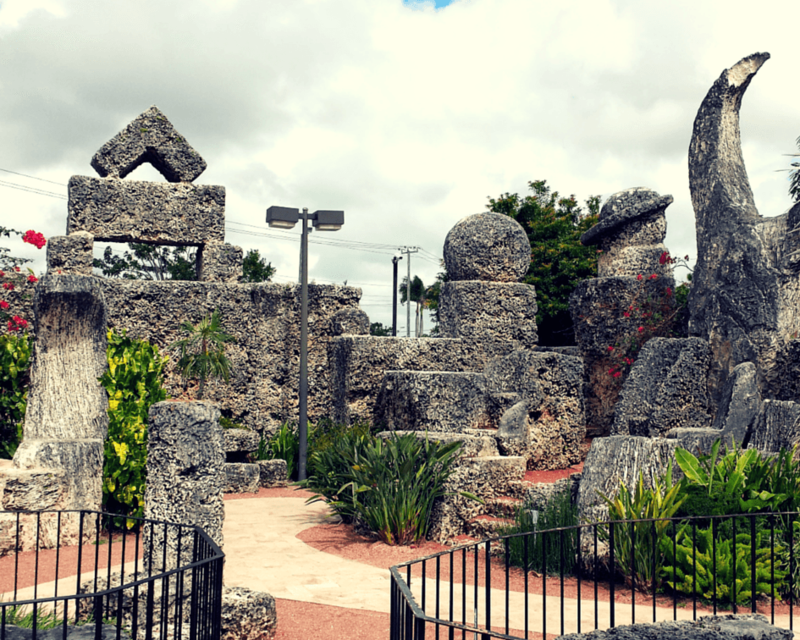 I remember the first time I saw the Coral Castle while driving back to my hostel. My friends and I immediately pulled a U-turn and had to stop and visit. It’s amazing what one man can do with a little physics. We were in Miami in 2012. We should have seen this! Your photos give a good look of the place but it would have been good to meet Ed. It sounds like you did. Would have loved to hear more about him and his story! Hi Carol! Not much is known about Ed since he was a very private person. But he was definitely a very interesting man! What a sad story but what an amazing castle he made! It is fascinating the strength and inspiration people get when an event in their life occurs. Looks like a beautiful place to explore though, he did a great job! Hi Samantha! Yes, it’s amazing how we can react to different events in our lives. Ed’s story was a sad one, but it left a beautiful monument for us all to share. What a lovely but sad story. Wow this is in Miami? I haven’t been giving Miami enough credit – had just of just written it off honestly as drunks on a beach 😀 Will definitely have to re-consider my position as this looks like a really fascinating attraction! Sounds more like an obsession than love, but who knows? Maybe it was truly a broken heart. I wonder what became of Agnes? Interesting tale. Thanks. Supposedly she was invited to see the grounds, but she never went. Florida is great for quirky and unusual attractions, I love it! I’m glad you enjoyed it Brianna! This is so fantastic! I’ve never heard of this before and that Ed guy sounds like a super interesting character. Thank you for sharing this! Hola 🙂 How interesting – and sad, like everyone says. Can’t believe I never stopped to check it out. Great pics!